The Food and Agriculture Organization of the United Nations’ Assistant Representative Dr. D.B.T. Wijeratne yesterday confirmed that it was in the process of formulating two policies for the Government to strengthen the country’s agricultural sector and food security. 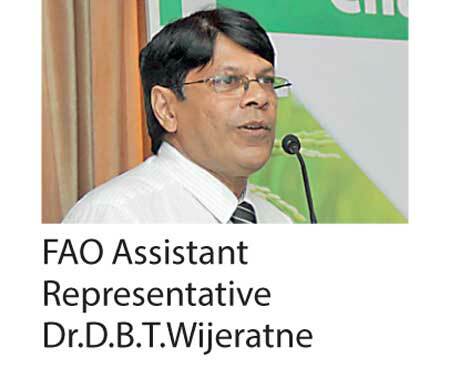 “At present we are in the process of developing the new National Agriculture Policy and National Policy for Primary Industries,” Wijeratne stated at a workshop titled ‘Challenges in Agriculture: The Way Forward’ organised by the National Agribusiness Council. He said the final draft of the National Agriculture Policy will be presented to the Department of Agriculture within the next six months. “In the process of developing these policies, we have two national consultants consisting local and foreign experts. A team from LTO will be in Sri Lanka next week (LTO - Land- en Tuinbouw Organisatie is the Dutch Federation of Agriculture and Horticulture). In the meantime, local consultants will meet stakeholders separately, including farmer associations, exporters, value addition parties, supply chain managers and so on for their suggestions,” he added. Noting that previous national agriculture policies mainly concentrated on increasing production, productivity and self-sufficiency, Wijeratne said the new framework would address food security factors as well. “A lot of focus is given to food security, a diversion from production, productivity and self-sufficiency. The new policy will also pay attention to nutritional security and food safety,” he added.